Innovation, design and affordability make Vere a best bet this season. 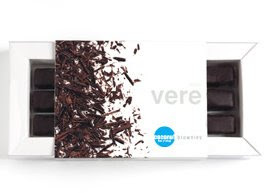 If you need to wow the chocolate lover in your life on a holiday budget, Vere's flourless brownies which are enrobed in dark chocolate and come in coconut, walnut, peanut butter and mint+nib, are more like truffles than baked goods. What I love even more than the modern take on the brownie is the slick packaging which makes them great for gifting and at $6.00 a box, you definitely get some bang. Also check out their unsweetened toasted coconut clusters (seen above) which happen to be sugar, alcohol and preservative free and might I add, delicious...I just singlehandedly finished off a box. 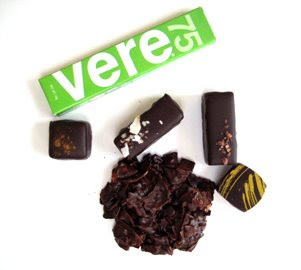 Vere chocolate is certified by the Rainforest Alliance which means the cocoa farm where it's harvested is required to protect wildlife, soil and waterways and workers and their families with health care, education, decent housing and wages. For those reasons, Vere chocolate is at the top of my list this year.